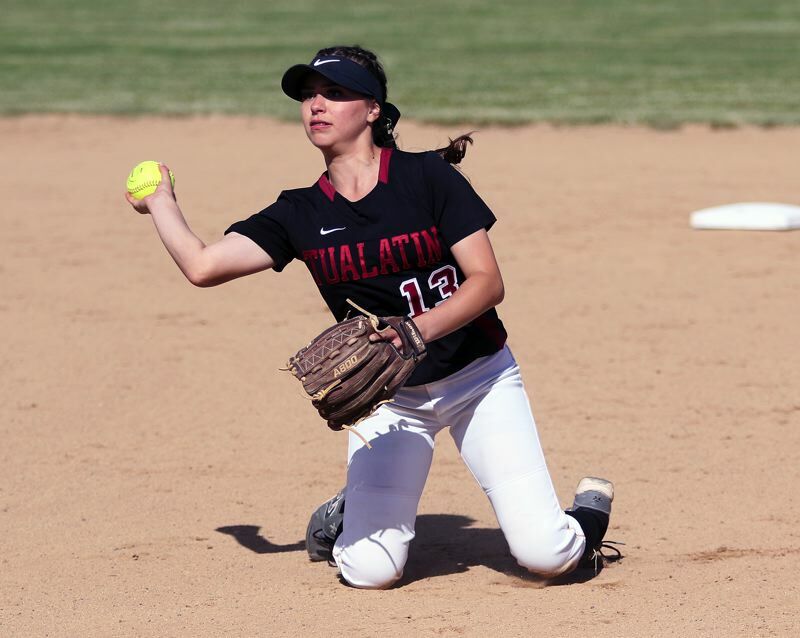 TUALATIN — The Tualatin High School softball team was looking for a spark. It was the semifinals and, trailing 1-0, the Timberwolves needed something, or someone, to get its high-powered offense up and rolling. Ridings, the No. 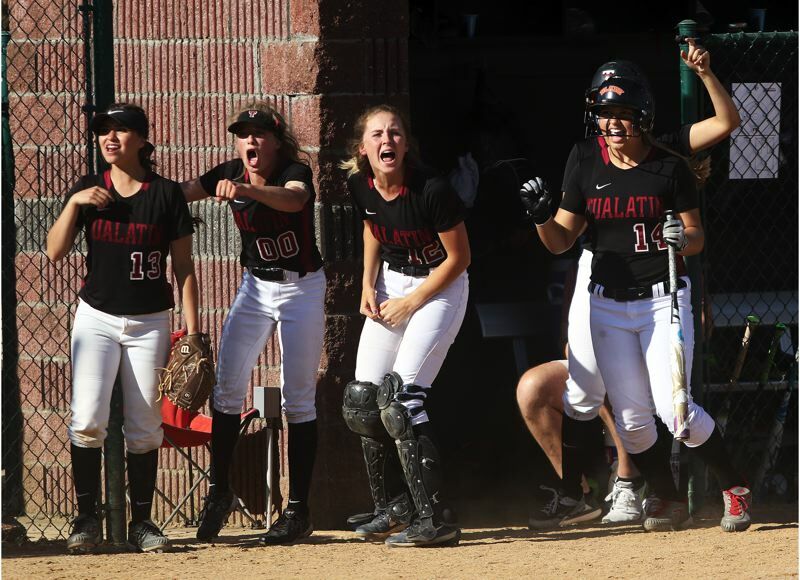 9 hitter in the Tualatin batting order, not once, but twice, ignited four-run innings with leadoff hits, helping the Wolves overcome that early deficit and get an 8-5 win over Oregon City in an OSAA Class 6A state playoff semifinal game played Tuesday at Tualatin High School. "I was just looking to do my job for my team," Ridings said after the game. "As a leadoff, wherever you hit in the lineup, your job is to do everything you can to get on base. I was just thinking, find my pitch, do it for my seniors, do it for my team." 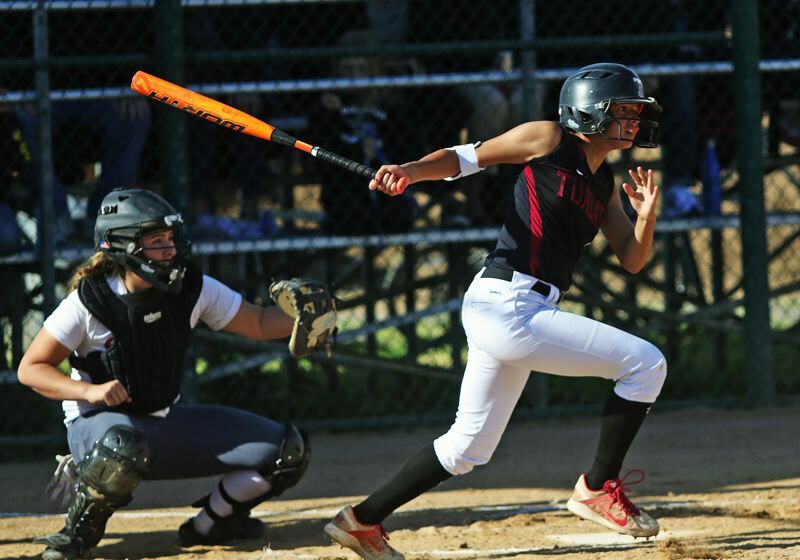 "Tia is great," said Tualatin senior Taylor Alton, who drove in a pair of runs in the win. "She knows how to give us a spark." 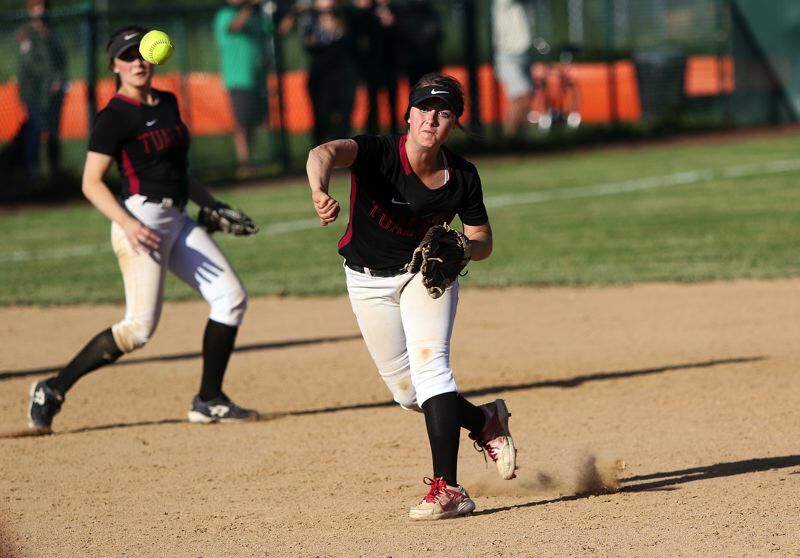 "She's a stud, she's really great," Tualatin senior pitcher Megan Woodward said. "Tia and Bella (Valdes) are great leading off an inning. They're everything. When you get them on, you get the momentum and you know you can score them, one at a time." 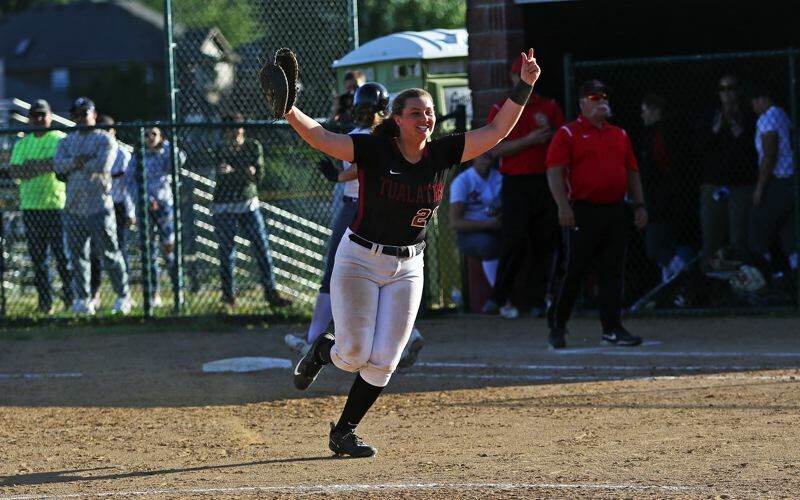 With the victory, Tualatin, the Three Rivers League champion, the No. 1 team in the final OSAA power rankings, and the No. 9 team in the county, as according to the latest USA Today Super 25 rankings, improved to 29-0 on the season. 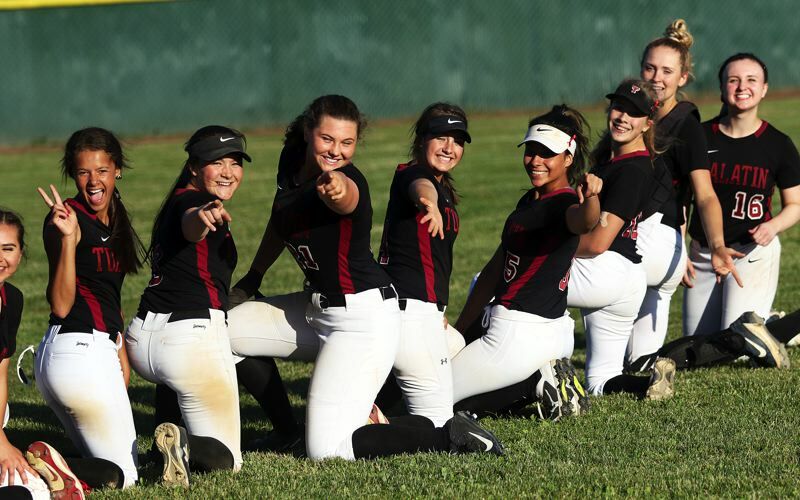 The Wolves also advance to the Class 6A state championship game, where they'll face Clackamas on Saturday, in a contest starting at 1 p.m. at the Oregon State University softball complex in Corvallis. "This is huge. This is everything," Ridings said. "This is the goal we set for ourselves in the beginning of the year. We all told ourselves we were going to do everything we could to make it here, and we did it. It feels amazing." "It's very big," Alton said. "It's amazing. It's a great feeling." 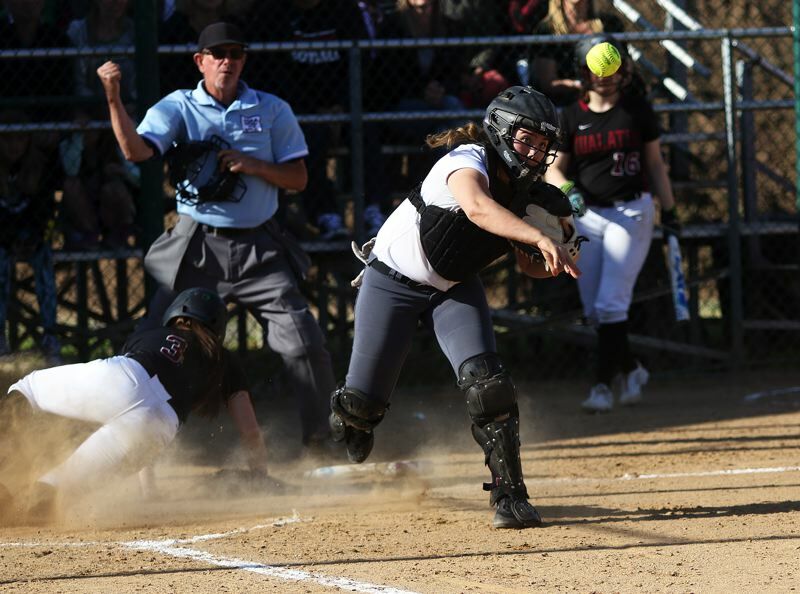 "This is huge to get over the hump from last year," Tualatin senior catcher Ella Hillier said, referring to Tualatin's 4-3 loss at North Medford in the 2017 semifinals — the last game that the Wolves have lost. Oregon City, the No. 3 team out of the Mt. Hood Conference, and the No. 5 team in the OSAA power rankings, finished its season with a final overall record of 24-6. 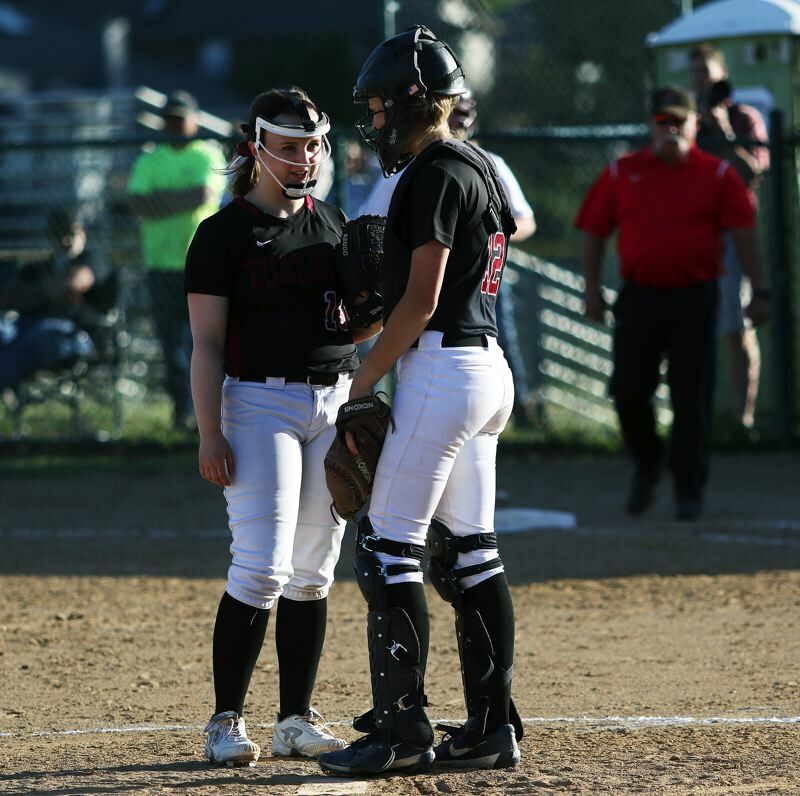 "This season, we came off a loss last year (a 7-1 semifinal setback against Westview) that was pretty tough, but our goal was to get to the end of the playoffs, and we were just short," said Oregon City senior Morgan Hornback, who had two doubles and a home run in Tuesday's game. "Our attitude stayed up the whole game. A girl makes an error, and we pick them up, and they get the next one. This team was awesome." 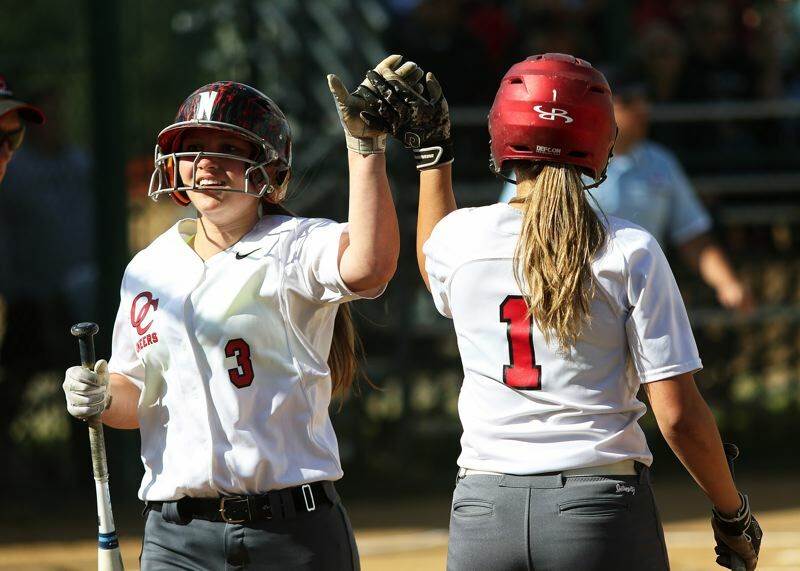 Oregon City struck first in Tuesday's semifinal contest, getting a run in the top of the first inning. Sophomore Isabelle Lewis got things going for the Pioneers with a one-out single to center field. One out later, Hornback doubled to the fence in center field, driving in courtesy runner Aliyah Kelly, giving Oregon City a quick 1-0 lead. But that didn't seem to bother the Timberwolves. "I've never been on a team that can come back the way our team does," Alton said. "This team never gives up and we never stop fighting. Even though we were down the first inning, we knew we could come back and rally as a team." "We knew we had to strike back, and when we did, we had to pile them on," Hillier said. That that's just what Tualatin did. With the Wolves still trailing 1-0 going into the bottom of the third inning, Ridings, leading off the frame, ripped a single to to center field. "That was amazing," Alton said. "Hitting is contagious, and that just really helped us get things going." Valdes then drew a walk on a 3-2 pitch and Hillier was hit by a pitch, loading the bases with no outs. 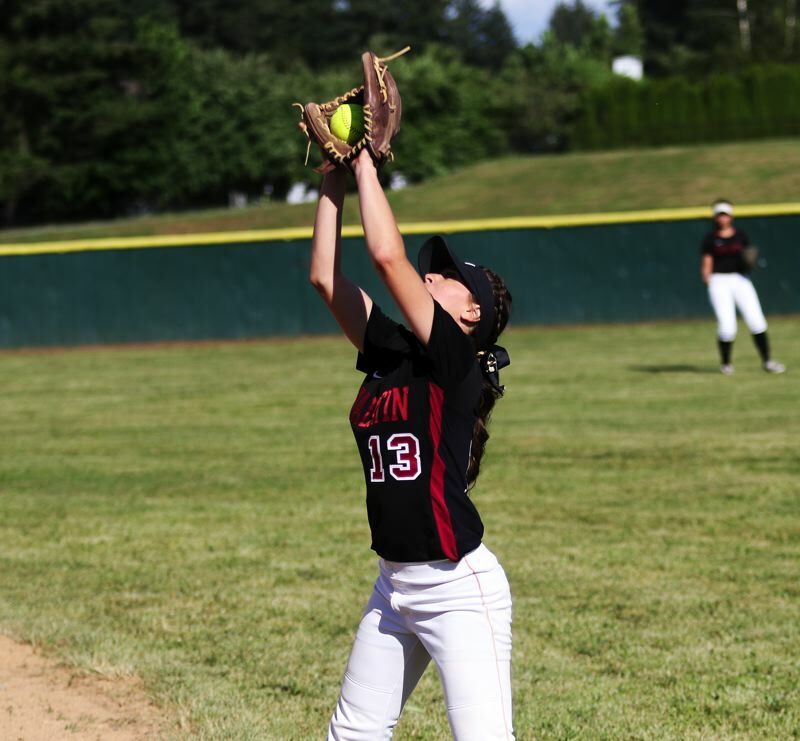 Junior Emily Johansen then hit a hard grounder, but Oregon City committed an error on a throw to the plate. Ridings and Valdes both scored on the play, giving the Wolves a 2-1 lead. 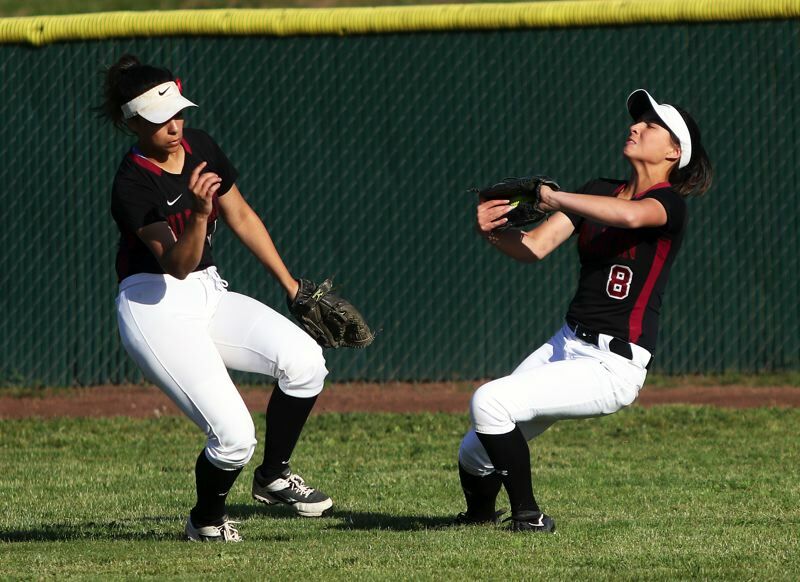 Then, after Alton walked on a 3-2 pitch, Oregon City, with the infield drawn in, committed back-to-back errors on hard-hit grounders by freshman Taylor Corcoran and senior Zoe Olivera. 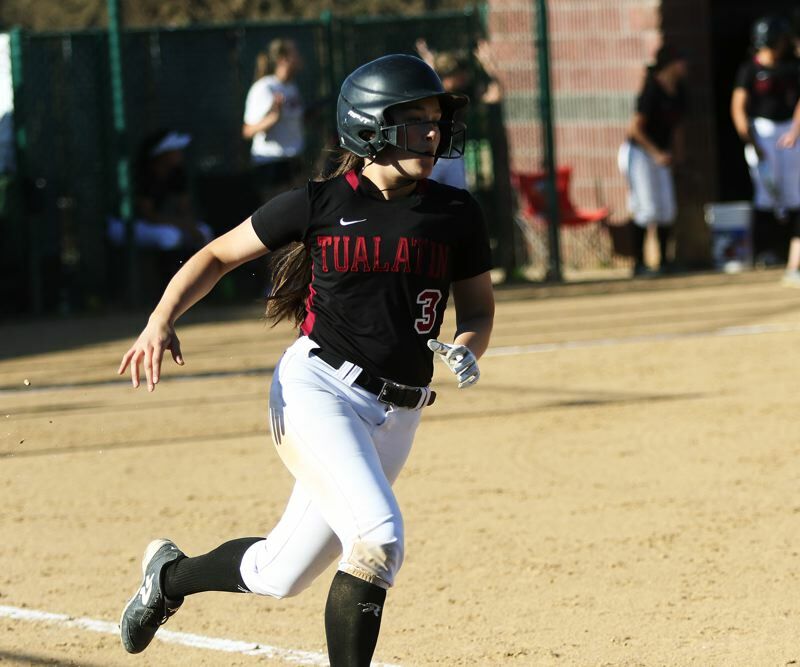 Sophomore courtesy runner Sydney Wagner and Johansen scored on the miscues, upping the Tualatin lead to 4-1. 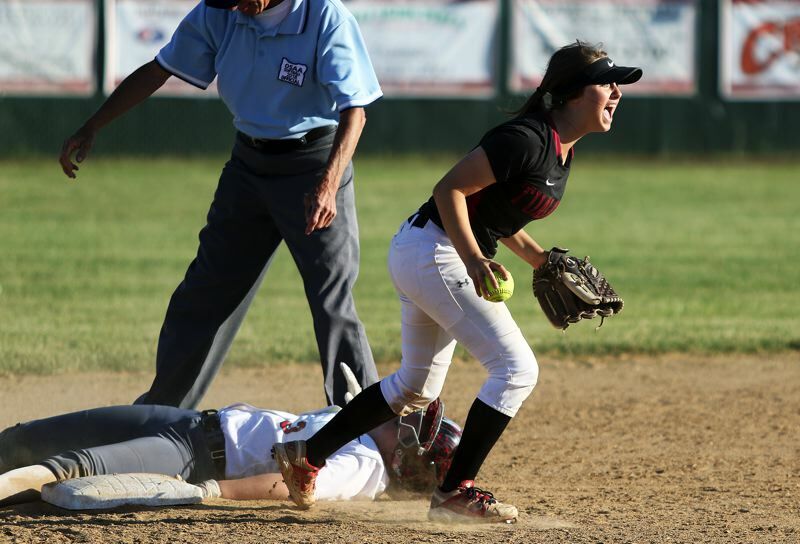 Oregon City got one of those runs back in the top of the fourth inning. Sophomore Hannah Stewart hits a one-out triple to right field and then scored on a two-out single by senior Allie Edwards, cutting the lead to 4-2. But the Wolves kept rolling in the bottom of the frame. Again, it was Ridings getting things going, this time with a leadoff double off the base of the fence in right-center field. "I was so excited. I was ready," Ridings said with a smile. "After that first hit, I just had confidence and I was ready to go." Valdes followed with a walk and Hiller then singled to center, loading the bases with no out. Johansen then hit a fly ball to deep center field. But, what looked to be a sacrifice fly bringing in one run, both Ridings and Valdes came around to score as the ball was dropped. Alton followed that up with a single down the left-field line, driving in both Wagner and Johansen, pushing the margin to 8-2. "That was good for me," Alton said. "I've been in kind of a slump, so I needed that. When I get up, with runners on base, my mindset is to get them in no matter what." 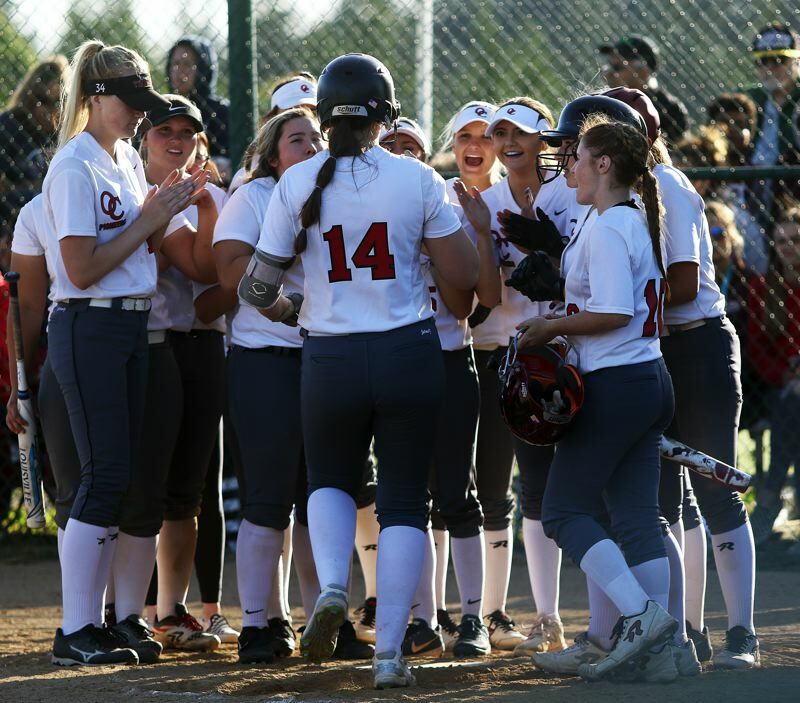 Oregon City, still battling, scored a pair of runs in the top of the fifth inning, coming in on a sacrifice fly by senior Ashley Spencer and a double by junior Jordyn Duntley, trimming the lead to 8-4. The Pioneers got even closer in the top of the seventh, at 8-5, when Hornback belted a two-out solo home run to center field. "I saw the ball well today, and just made contact," Hornback said. 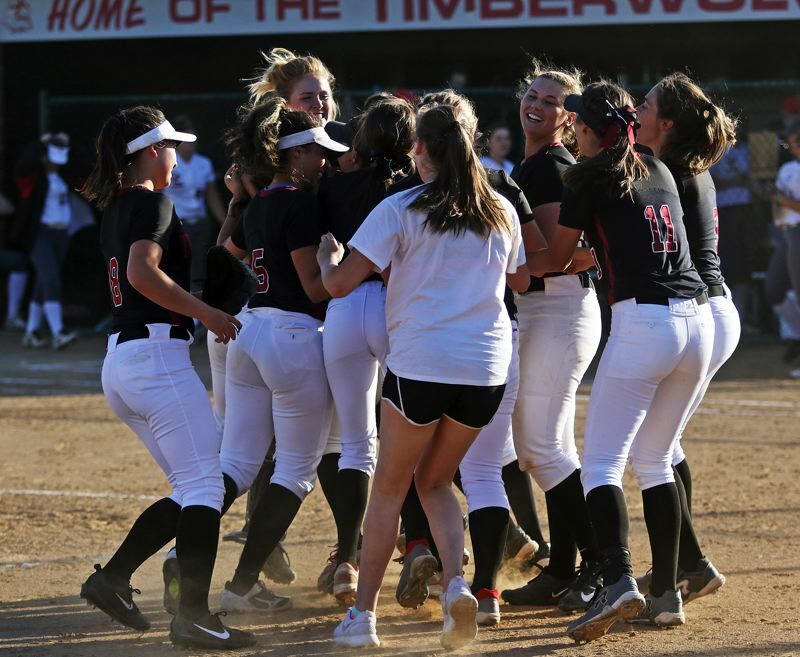 But Woodward coaxed the next Oregon City batter to pop out to junior second baseman Andrea Gomez, igniting the Tualatin victory celebration. "Oh my gosh. Those are the games you live for. That was a fun one," Woodward said. "I knew, walking into it, that there was no way we were going to lose this game. You have to have confidence, but anything can happen. We proved tonight that we deserve to be here. We worked really hard." "I never had any doubts," Hillier said. 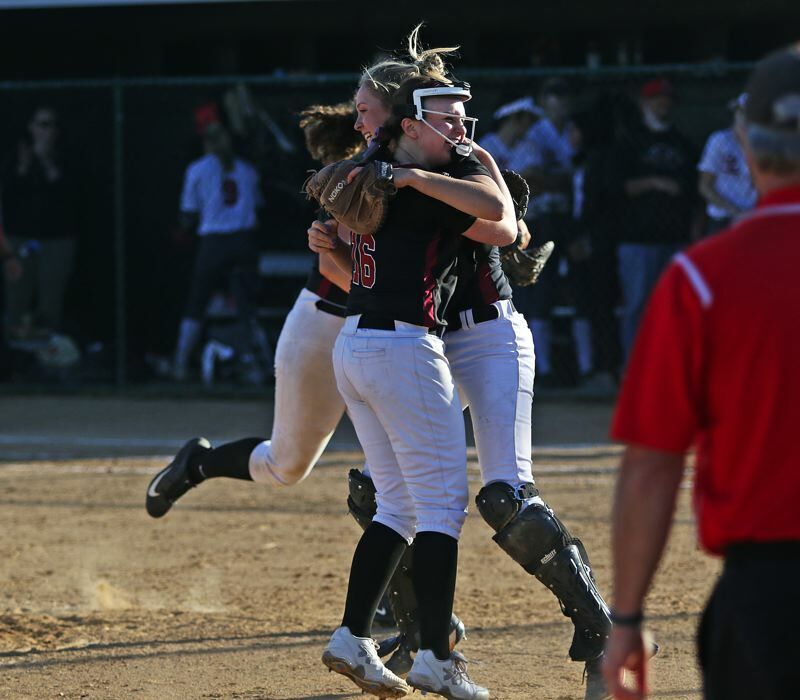 "We knew that Oregon City was going to bring a good game, and they did, but I never had any doubts. We came in confident, and we knew we could do it." 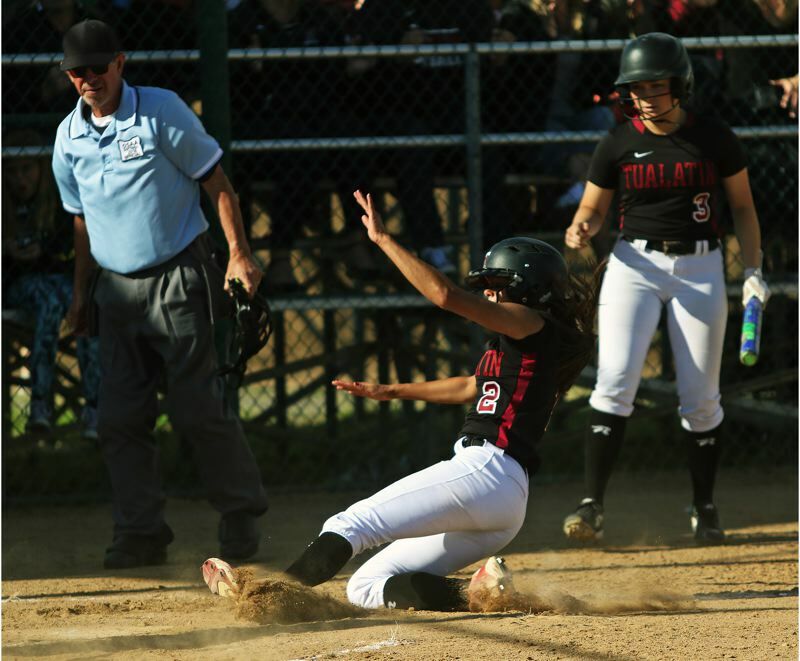 Tualatin, as a team, had seven base hits in the contest. Ridings went 2 for 3 at the plate with a double and two runs scored. Corcoran went 2 for 4 with an RBI. Valdes went 1 for 2 with a double, two walks and two runs scored. Wagner and Johansen each scored twice, with Johansen also driving in a run. 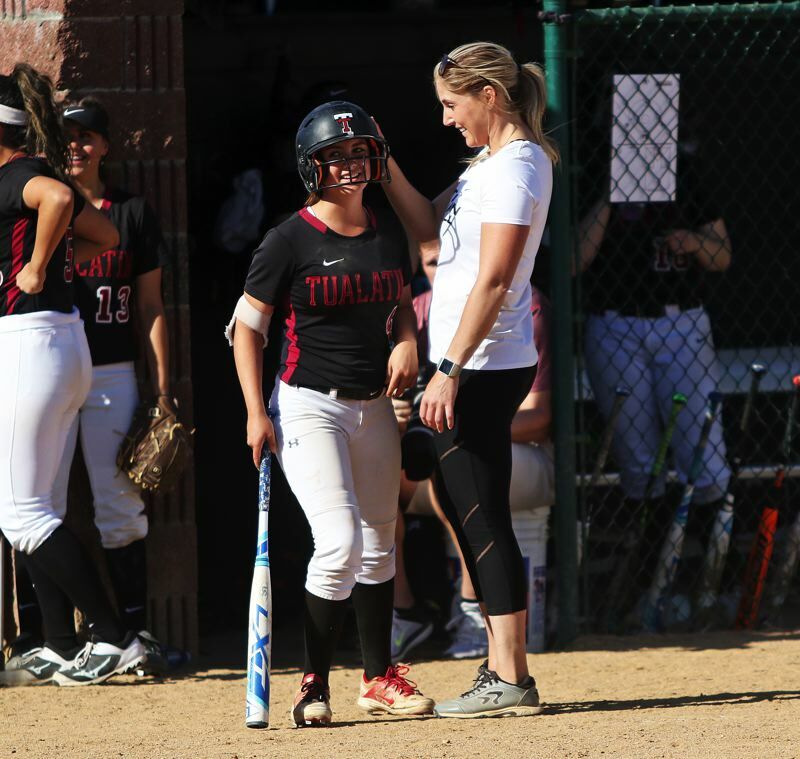 Hillier and Alton had the other Tualatin hits. Woodward, in seven innings pitched, gave up five runs (four earned) on nine hits, while striking out four and walking one. 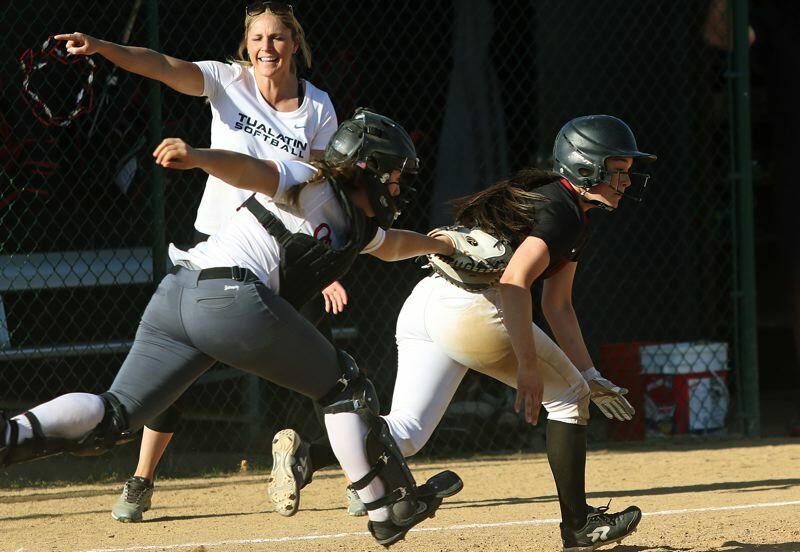 For Oregon City, the Texas Tech-bound Hornback went 4 for 4 at the plate with a home run, two doubles and two RBIs. She also pitched a complete game, giving up seven hits, while striking out six and walking five. "I came out ready to hit," Hornback said. "We were a little shaky on our defense, but we battled to the end. All season, we've been really good a that plate. The other team scores a run, we score two, that's the way it works. We came up a little short today, but we still hit." 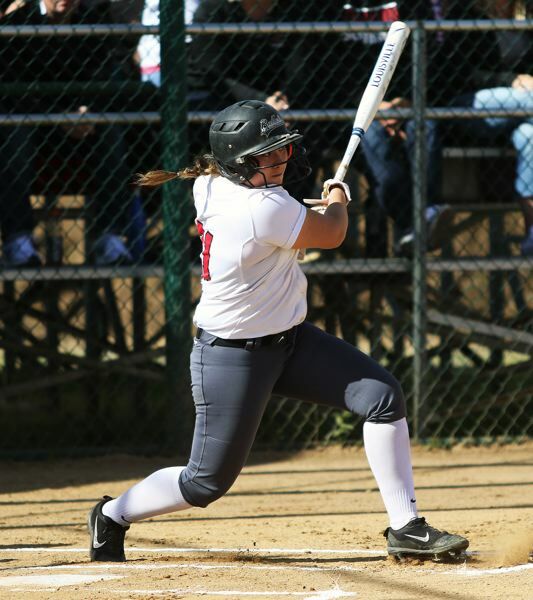 Edwards, Lewis, senior Zoie Iverson, Duntley and sophomore Hannah Stewart had one hit apiece for the Pioneers.